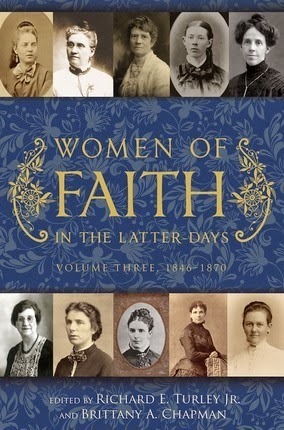 As with the first two volumes of this series, Women of Faith in the Latter Days: Volume Three, provides a window into the lives of women in the early church, both those who are well-known and those who are relatively obscure. The format has changed slightly; instead of splitting each chapter into two sections (a brief biographical sketch and then a more in-depth "life experiences" portion), each chapter is now a single continuous piece, seamlessly blending the woman's life experiences with the overarching narrative of her life. Mary Elizabeth Woolley Chamberlain received her temple endowment at the age of 12! Martha Maria Hughes Cannon ran for state senate as a Democrat against her Republican husband and won! Maud May Babcock's smiling face greets the reader at the beginning of the first chapter and stands out against the other mostly dour photographs, more standard for the time. Kirsten Marie Sorensen Jensen was called into her local Primary presidency in Orderville at the ripe old age of 12 and died in 1973, the year my parents married. Three women of color are profiled: Tsune Ishida Nachie, the first Japanese convert to enter the temple; Mere Mete Whaanga, who wore the traditional blue Maori facial tattoos and was the first Maori to travel to Utah; and Cohn Shoshonitz Zundel of the Northwestern Shoshone tribe, who served as a counselor in her ward's Relief Society for 35 years. While polygamy was definitely mentioned in both of the previous volumes, it is a constant theme in this third volume because of the time frame covered, and the wide variety of responses from these women emphasizes that polygamy was not a one-size-fits-all experience. Some of the women struggled mightily with polygamy, with feeling abandoned or ignored by their husbands, with loneliness and a lack of close companionship. One left her husband when he took a second wife, another received a divorce for "nonsupport". Other women spoke of their love for their husbands' other wives, the support they provided to each other, and their devastation and "palpable loss" when the Manifesto seemed to make their "great sacrifices" meaningless. Some women even entered into polygamy after the Manifesto and lived apart from their husbands for their entire married life in order to prevent their imprisonment. It's fascinating to hear about the living reality of polygamy from these women in their own words. Mormon women are anything but monolithic.